1. 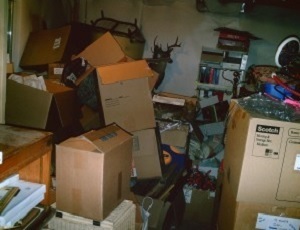 Used boxes are more likely to collapse or break down. Used boxes can be weakened by previous wear and tear, or exposure to moisture or water. 2. Lack of uniformity in size. Your local liquor store, supermarket, or business office might be great places to get free used boxes, but typically these will come in many different shapes and sizes. Unfortunately, when stacking, this can lead to an inefficiently organized storage unit. 3. Lack of knowledge of what was previously stored in the box. Residue, dirt, and odors from previously stored items could damage your valuables. 4. Insects or insect larvae could reside within the boxes. Parasites or insects such as bed bugs, lice, termites, scabies, and others may have come in contact with the used boxes. Unfortunately, one of these creatures could cause serious damage to your stored items. 5. Rodent feces and droppings may reside in a used box. These could be harmful to you and your family’s health. To maximize the storage area in your storage unit, you are going to want to create uniformed rows of boxes, with the largest boxes on the bottom rows and the lighter ones on top. The ideal situation is to have sturdy boxes that are the same shape and size. You might even consider putting a piece of wood shelving on top of each row to create a more stable environment. 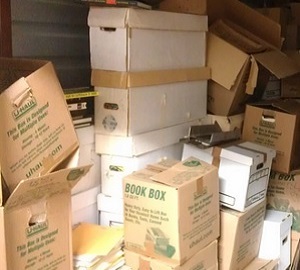 The problem with used boxes is that when stacked on top of each other, they can weaken and fall apart over time, causing damage to your packed items. Additionally, used boxes make it difficult to have an efficient well-organized storage unit, especially if your boxes come in different shapes and sizes. San Clemente Self Storage sells new storage boxes in a variety of sizes to fit your storage needs -- from small boxes to large wardrobe boxes. Stop by our office to see our large selection of boxes and other moving supplies. Buying your boxes at the storage facility ... you talk about convenience! But, before you start packing those wonderful new boxes, it is important to know what items cannot be stored in a storage unit. For the safety of all tenants, please read the Storage Tip on "What Can't Be Stored". More information on prohibited items can be found in our lease and facility rules. If you have any questions or concerns, please call us at 949-366-1133.